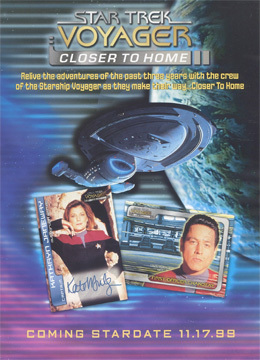 SkyBox based Voyager Closer to Home around Seasons 3, 4 and 5 with every episode represented with at least one card from the base set. 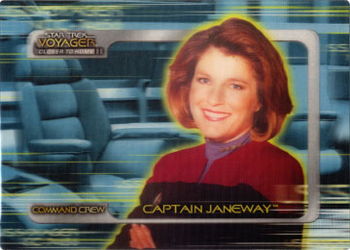 There is a common subset featuring Janeway’s Adversaries using numbers 268-276 (alternatively numbered JA1-JA9) of the base set. There was s significant number of damaged cards from many of the packs, almost certainly a production/packing issue. Collating good quality base sets became difficult due to the same cards tending to be seeded at the same point in the packs. 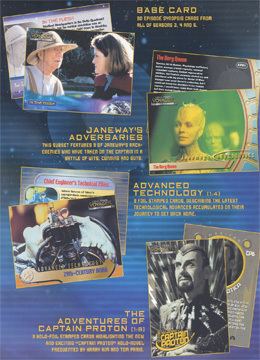 There are also a number of incomplete summaries on the backs of some cards. The numbering for the base set starts, strangely, at 178 instead of 192. 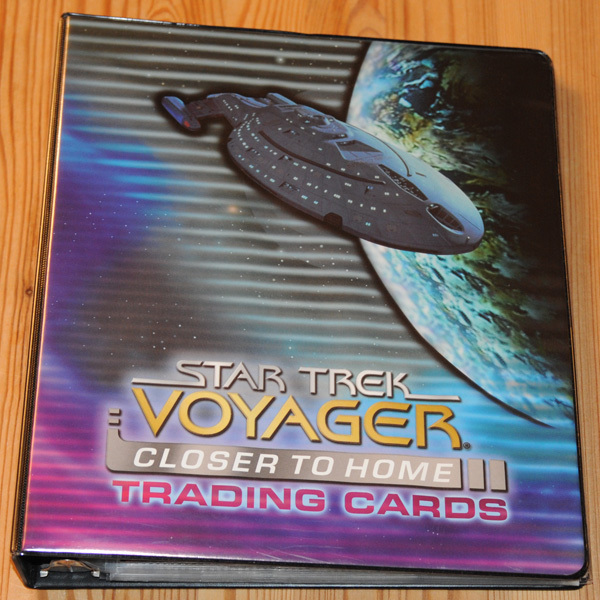 Starting at 192 would have continued the numbering from the Voyager Season 2 base set, which ended at 191. Chase sets include; Advanced Technology (1:4), The Adventures of Captain Proton (1:8), Interstellar Species (1:12) on yellw/green plastic (written from 7 of 9’s point of view), parallel Interstellar Species on orange plastic (estimated odds of 2 per case), and Command Crew (approx. 1:54) lenticular cards numbered sequentially to 750. 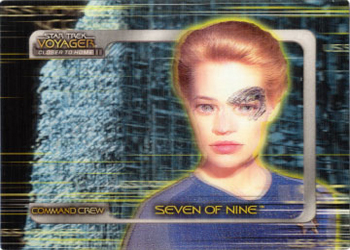 The checklist has incorrectly assigned numbers to the Neelix and Seven of Nine Command Crew cards. 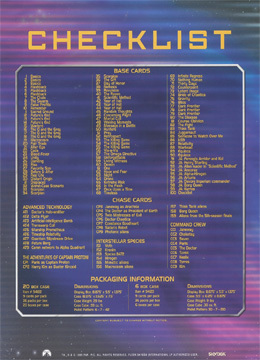 Neelix is listed as CC7 and Seven of Nine is listed as CC3, whereas the cards are actually numbered the other way round. 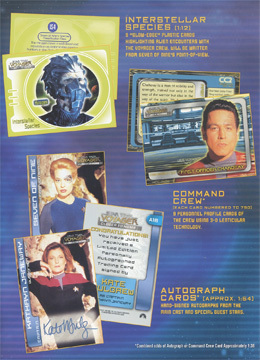 Nine Autograph Cards (approx. 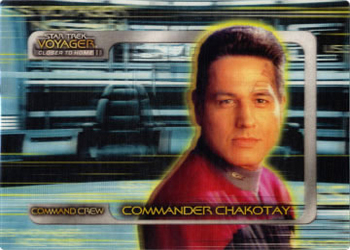 1:54) of the main crew members were produced for this set, of which two, (Kate Mulgrew and Jeri Ryan) were replaced with redemption cards. Skybox 17 November 1999 10,000 ? 36 9 2½" x 3½"
Other Item - Robert Picardo Autograph card Numbered n/200 & Embossed "RAP Library of Robert Picardo"